Lingsey a remote village of Kalimpong Sub-Divison is situated at an altitude of 4800 ft. and is 24 km from Pedong & 52 km from Kalimpong Coordinates: 27°9'46"N 88°40'29"E. It is assessable from Kalimpong & Gangtok also, via Rhenock a small town of East Sikkim near Aritar. Lingsey is an ideal eco-village tourist destination where tourist can enjoy and be with the nature. Blessed with so much of natural beauty and a rich cultural heritage, majestic mountains, lush green forest intermingled with hospitable people provided the most suitable landscape. It is ideal opportunities to effectively use tourism as a tool for conservation and at the same time reap economic benefits form the business. Village tourism in Lingsey is a unique experience in the Hills. One gets to experience the various ethnic tribes and clans of this region. The Lepcha's the first known settlers, the Bhutia's who traced their ancestry to Tibet and the Gorkhali the largest ethnic community provide vibrant cultural presence and warm cordiality of the rural people never fails the mesmerize one. The ethnic communities have distinct language, culture, customs and architecture which becomes an ideal experience for the visitors to sample. The houses are mostly built from local materials and are well constructed and comfortable. The overwhelming impression of the village is one of order and cleanliness but with a warm and welcoming feel to it. Well designated trails through the village are neatly carved out along the terraced rating the outer house environment beautifully is expressed through a riot of Orchids and Begonias. With ample of rain and warm sunny days the greenery up by melodious bird calls this certainly becomes a high light of ones trip. The panoramic mountain vista just adds on to the beauty of the landscape. Short walks around the village take you to the local households, cardamom and paddy fields, local shrines, lakes, waterfalls, nearby forest and herbal gardens. It is second largest temple in Darjeeling district. It is the popular monumental evidence of the Hindu religion. It is famous in Nepal, Bhutan, and Bangladesh. 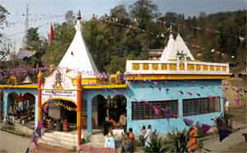 Throughout the year several Hindu festivals are held in the temple complex. The most important among them are the Sawan Bool Bum, Shivaratri, Durga Puja, and Bala Chaturdasi. Hareswar Shiva Linga is the main attraction of pilgrimage at the time of Sawan as Bol Bom. 5 Minute walk from Hareswar Shivalaya Mandir (Temple) is the Pellembo Lepcha Monastery which is oldest in the Darjeeling, build in the 19th century. One can visit the village to know about Lepcha's tribe, traditions life style and culture. Unique feature in the construction of traditional Lepcha house is that no nails are used. This is an interesting point to begin ones exploration of Lingsey Jumthang a Lepcha Village. While visiting the traditional house, one can walk further beyond to see the Sankhey Dhunga (Holy Rock). Sankhey Dhunga is the stone in the shape of snail. Used to worship by Hindu devotees. Local people believe that it protect the locality from Natural calamities. The word Dabai pani is derived from the Nepali word ‘Dawai” which mean Medicine and ‘Pani’ mean water, is popular all over the region, these natural spas are said to have curative powers of many skin disease. This River has its source in the dance forest of Neora Valley and it is joined by several small Streams. One can enjoy fishing, Camping or exploring the river banks. 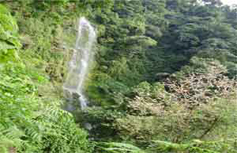 The Servang waterfalls one of the tallest falls is the region having the hight of 200 ft. The sound of the volume of water dropping can hear from far off. One can see a panoramic view of Lingsey Village, and surroundings. And can also view Mighty Kanchenjunga Range as well as Neora Valley Nation Park. Locally it calls “Oraray” which mean a Cave. In ancient time when villagers used to do hunting wild animals, while retuning back they used to shelter in this cave at night. A monastery considered as one of the holiest and oldest in Kalimpong Sub – Division. The visitor’s can imbibe the tranquil air with splendor of monastic arts reflected in its traditional architecture, carved & painted murals and treasure of manuscripts and icons. Sherpa community use to worship in this monastery which is based on Buddhism. “Mangkhim”, a Temple of the Rai & Limboo of Nepali origin is located at “Mudong Goan”. Branch under Sericulture Research Institute in Kalimpong, which is a place for breeding the silkworms. The center facilitates farmers to engage in sericulture. The centre provides all necessary help to the farmers by transferring know-how and expertise skill training required for breeding silkworms and cultivating mulberry tree. Situated in hill top, the village called Mulkharka. Shadow of Mt. Kanchenjunga reflects in the pure water of the lake like Mt. Macha Puchre reflects is Phewa Lake in Nepal. All the drinking water sources of Lingsey village originate from the Lake. It is Popular as Manokamana (Wishing) Lake. view the Mt. Kanchenjunga range and various Parts of Eastern part of Sikkim as well as Lava, Rishop and Pedong. One can visualize the Dense forest of Neora valley National Park. It is situated in Pangola Range of the Himalaya, and counted as a important view point of the area of (Neora valley National Park) one can see the view of the china border. Situated in Upper Neora Valley National Park, which is also a border point of Bhutan, Sikkim, & West Bengal. Neora Valley Nature Reserve is one of the last remaining pristine ecosystems of the Eastern Himalaya with its amazing bio-diversity, and is home to many rare and endangered, plants, animals and birds. Trek in an area rich in natural history and beautiful views this is just the trek for you. For birdwatchers this trek is attractive during the spring months of March to June. Neora Valley National Park is also the home of Red Panda. A cute little animal with reddish brown body and a bushy ringed tail is one of the most endangered species in the world. The recent discovery of Royal Bengal Tiger in Neora Valley has prompted the administration to include the park in the list of sensitive wildlife zones in the country. According to the 2002 tiger census the park holds 19 majestic big cats. Among the other important mammals Indian Gaur, Himalayan Black Bear, Clouded Leopard Common Leopard, Lesser Cats, Himalayan Thar, Sparrow, Gorals, Deer and Squirrels are worth mentioning. Due to its altitudinal variation ranging from 600ft to 10600 ft, various species of birds make the park a paradise for the bird watchers. Pheasants, Cuckoos, Flycatchers, Maynas, Orioles, Owls, Parakeets, Partridges, Sunbirds, Swallows, Swifts and Woodpeckers would captivate one with their chirpy calls and enchanting colorful plumage display. A wide varieties of birds of this region can be seen during different seasons. Endanger species of birds know as Bhenguma regarded as king of all birds is found in the forest nearby area. The birds are migratory and one has to plan out to get glimpses of these birds. The Rajpakshi another endanger animals also found in the forest. Bird watching in khola kharka forest.